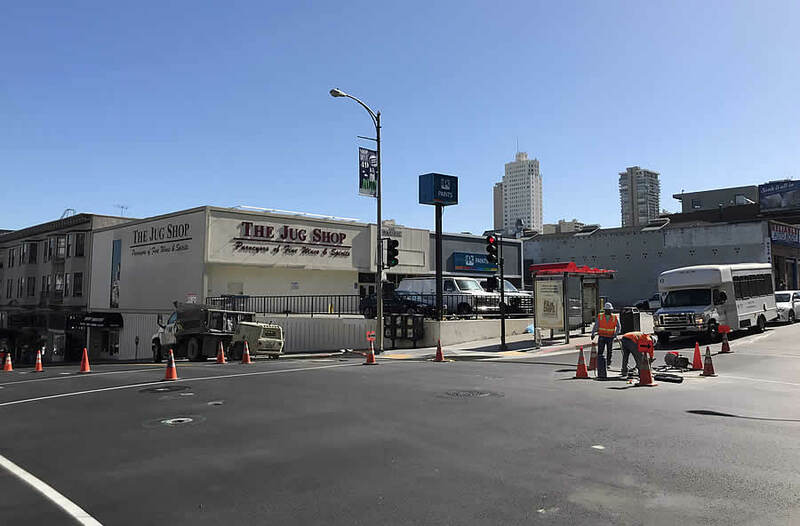 Plans to level the iconic Jug Shop complex on the northeast corner of Polk and Pacific are in the works. And as envisioned by JS Sullivan Development, a six-story building will rise up to 65 feet in height upon the 2030 Polk Street site, with 43 market rate condos over 6,500 square feet of new restaurant/retail space fronting Polk Street, with the residential lobby fronting Pacific, and a basement garage for 21 cars and 43 bikes. The proposed condos would range in size from a 931 square foot one-bedroom to a 2,682 square foot three bedroom on the sixth floor, with an overall mix of 21 one-bedrooms, 18 twos and 4 threes. 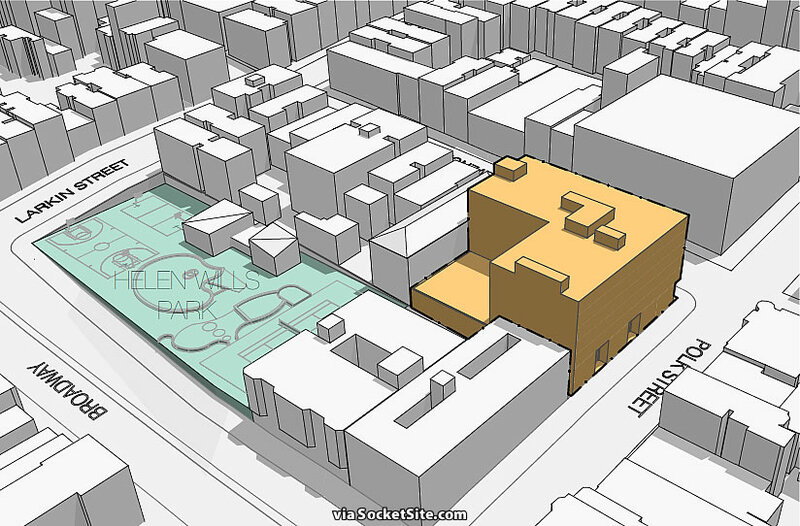 And while the proposed shape of the building would allow for the inclusion of a large rear yard and minimize the potential shadowing of the adjacent Helen Wills Park, it would require a waiver of the bulk limitations outlined in San Francisco’s Planning Code in order to allow for a continuous six-story-tall street wall along Polk and Pacific. We’ll keep you posted and plugged-in as the plans progress. I cannot imagine what might be “wrong” with a six-story street wall along Polk/Pacific in this location. “Iconic”? not so sure. .. . I just walked by that place yesterday – its across from the boarded up Lombardi’s – another sweet site for housing. Last I heard Peskin was monkeying with that site. Here’s hoping he lets these project progress (per city laws) or we get a new supervisor over there. . .
Quote marks indeed: I’ve always defended use of that term here in the past, but it seems absurd in this case…unless we’re to assume merely having a parking lot in this neighborhood constitutes an icon. The same Jug Shop that has been fighting the Whole Foods 365 up the street? Ha! Pity, that’s a pretty good liquor store. It’s a good shop, but there are still really nice ones around SF. K&L is pretty much the largest, but Healthy Spirits and Epicurean Trader are both very good as well. It’s one of the only places in the city that I know of, that will ship liquor for you. It’s been a great resource for mailing out client and family gifts for years. And the topper is the staff are awesome. It’s a good liquor store, but I wouldn’t call it “iconic”. They got a good selection, but I rarely go there because they’re a pain to get to. They should move to a location more like City Beer Store. Better that there is no blank wall – should be unit entrances on the street rather than 1 main entrance, keeps the street scape active and prevents large bank areas. Otherwise I say Yeah! A 6-story blank wall on Polk would create a big pause in street life (similar to the pause on Polk caused by the parking lot now) Hoping planning sees this neighbor’s advice to LEARN FROM MISTAKES. I live in the nieghborhood too – pretty much every building before and after fronts Polk street and this would offer a street level retail space. How would this create a ‘pause’ in street life? Where does it say anywhere that there would be a 6-story blank wall on Polk St? The illustration is simply a massing diagram, not a rendering. Agree – there’s some misinterpretation happening here. The jug shop used to be across the street where the new condo building that contains belcampo. The jug shop space used to be a video rental store. Jug shop has moved before. Why can’t the jug shop move into another space? Some of the new buildings on van ness have large empty storefront spaces. Yeah, it’s only been in it’s present location for ~10 years.. I agree with others — this space is in no way “iconic”. I lived near here and walked by it multiple times a week and always felt it was an eyesore. Jug Shop does a good business but it has not been in that location for a very long time. I imagine since they are successful it would not be too difficult to find another spot. Businesses like Polk Street Boxing Gym (now HitFit SF) were easily able to find alternative spots for their business close by when their site was flagged for new development. 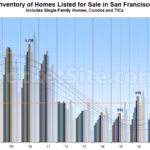 This massing is completely appropriate for the site. Let’s do it!